The chamber music festivals that are treasured by music-lovers share several features – the day is full of music from morning to midnight, the programming repeatedly discovers unexpected repertoire and great but lesser-known musicians, all works are properly rehearsed, there is a strong programme of masterclasses and facilities for young musicians and audiences keep coming back. This is what we try to achieve in Bantry. The Festival lasts for nine days, there are five concerts, three masterclasses and a talk most days. There are instrument making workshops, the hundred or so invited musicians are without exception superb, the programming combines the challenging and the unknown with the familiar and the whole town is taken over for rehearsals. Bantry House is the main concert venue along with the small single-aisle church dedicated to St Brendan, whose legendary Brendan Voyage began in this part of Ireland. 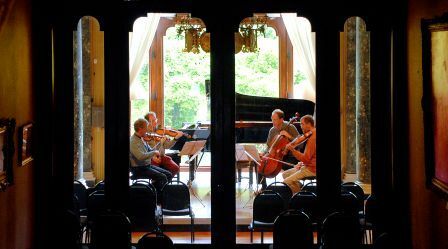 All the venues have an intimacy that is vital for chamber music and Bantry House itself is renowned for the atmosphere created in the candle-lit Library and the House’s extraordinarily beautiful setting at the head of Bantry Bay. All events are within walking distance of the central hotels and one can find oneself crossing the Square in the company of world-famous musicians. The intimacy of place and venue creates a special community of musicians and music-lovers.